Swiss Chalet may be known for their rotisserie chicken, bread rolls and that secret sauce we've all tried to recreate at home... and failed. So when you're cutting back on calories or trying to eat healthier takeout, restaurants like this one can leave us with tricky menu options. Generally, eating out at any restaurant may mean sticking to smaller portions, healthier sides like salads and avoiding pop or alcoholic beverages. Toronto-based health and nutrition expert Rosanna Lee says, when you are eating out at Swiss Chalet, stick to lean proteins. "Opt for skinless white chicken if you are really trying to cut calories and watch your fat intake. However, even with skinless, you can still rack up excess calories from lean meat if you eat more than your recommended daily servings — typically two to three servings of protein per day," she says. "Don't be afraid to share your food or doggy bag your food home if you can't finish it." Lee says to also ask yourself if you're hungry or full. If you're not hungry, chances are you could probably stop eating. And as a general rule at Swiss Chalet, watch out for dressings and sodium-filled sides, as well. "The sodium levels for all of their salads without dressing are on average double that of a Quarter Chicken Dinner (white meat, without skin), which may be surprising to some. If possible choose to have the chicken, bacon bits, and dressing on the side to control for sodium and fat intake." Below, we asked some Canadian dietitians what they would tell their clients to eat if they were at Swiss Chalet. All of our experts stuck with the full menu and some of them played up sides and starters. 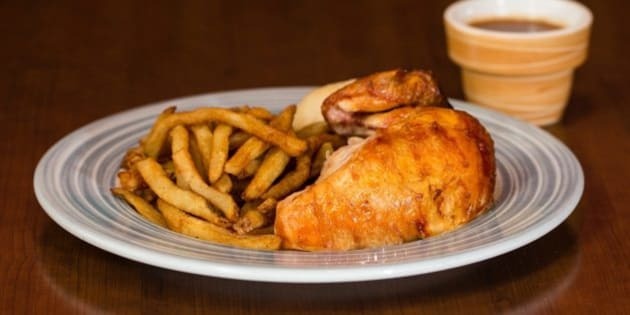 Are there any healthier alternatives you order at Swiss Chalet? Let us know in comments below. Which restaurant would you like to see us tackle next? Shoot us an email at CanadaLiving@huffingtonpost.com or let us know below.